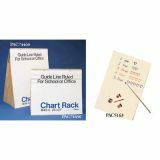 Wide ledge support flannelboard, pocket chart, posters, etc. Markerboard panel. Overall height approx. 56". Panel 24" x 35 1/2.". 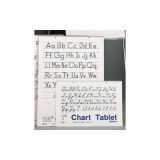 Chart Tablet - 24" x 16" - punched top & bottom - 30 sheets/pad - 1" Ruled"
White sulphite bond paper spiral bound to stiff covers. 2-hole punched. Ruled both sides. Punched top and bottom. 30 sheets. Recyclable. 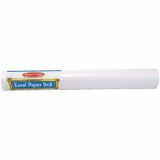 Easel Paper Roll, 18" x 75' (25 yds)"
Imagine the possibilities! This extra long roll of premium white bond paper is 18" x 75'. Draw with pencils, crayons, markers, chalk or paint with poster or watercolor paints, this paper is awaiting the imaginative touch! Whether on an easel, a table or unrolled on the floor, this is the perfect paper for any project or masterpiece! 18" x 75' (25 yards). GoWrite! 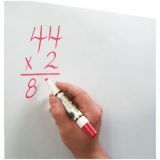 Self-Stick Dry-Erase Sheets, 8 1/2" x 11", 5 sheets"
Turn any surface into a dry erase board. Markers will not bleed through so they can be used over and over again. 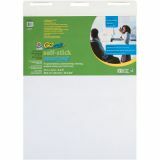 Choose either rolls or nonadhesive or self-stick removable sheets that are guaranteed to erase. 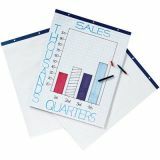 The sheets are laser/copier printable to make your own custom dry erase sheet. 5 sheets per package. 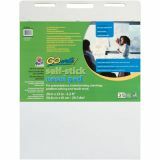 GoWrite!® Self-Stick Easel Pad, 20" x 23"
Each sheet has a 2" adhesive strip on the back making it the perfect instrument for any meeting. Great for brainstorming, problem solving, and much more. Write down the group thoughts and post the sheets on the wall as you fill them. Bleed-resistant with a sturdy cardboard backing. Removes cleanly without leaving residue behind. Recyclable. 20" x 23". 25 sheets. 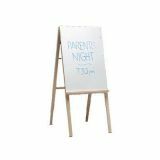 GoWrite!® Self-Stick Easel Pad, 27" x 34"
Each sheet has a 2" adhesive strip on the back making it the perfect instrument for any meeting. Great for brainstorming, problem solving, and much more. Write down the group thoughts and post the sheets on the wall as you fill them. 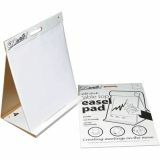 Bleed-resistant with a sturdy cardboard backing. Removes cleanly without leaving residue behind. 27" x 34". 25 sheets. Recyclable. 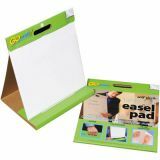 GoWrite!® Self-Stick Table Top Easel Pad, 16" x 15""
GoWrite!® Self-Stick Table Top Easel Pads, 20" x 23""
Lecturers Pad & Graph Pad - 4 pads/carton - Ruled Squares 1"
Lecturers Pad & Graph Pads - perforated 1" from top - 3 hole punch - 27" x 34" - 50 sheets/pad - 4 pads/ctn - Ruled 1""
Manila Tag Chart Sheets - 24" x 36" - 100 sheets/ctn - 1" Rule"
24" x 36". 100 shts/ctn.